Individuality can be scary if you’re used to just blending in! Wearing vintage is all about discovering your individual style so take a deep breath and be brave, you might just inspire the people around you to be a little braver too! You don’t have to leap headlong into vintage fashion, you can just start by adding a gorgeous vintage accessory to an outfit you normally wear. It isn’t as scary as wearing something completely different, look out for cute vintage sunglasses, jewellery and handbags to ease you in. Once the compliments start flooding in your confidence will soar and you’ll be ready to take your look to the next level. Don’t feel that you have to wear all vintage, a vintage dress with modern accessories can look amazing, so wear vintage your way. You don’t have to look ‘authentic’ (unless you’re going to a fancy dress party) so enjoy wearing individual items you love. Just because you’re buying vintage you don’t have to skimp on quality or fit. There is an enormous amount of vintage fashion out there, so make sure you buy good quality clothes which both fit and suit you (just like you would buying high street fashion). That’s what makes the difference between looking fabulous and looking like you shop in a thrift store. One really important thing is to know your measurements and always try clothes on if you have the opportunity. Smile and know you’re doing something good for the planet! Vintage is a great way of recycling. It not only saves on the ecological costs of modern clothes processing and the clothing miles which are associated with todays’s fast fashion, it also reduces the amount of clothes sent to landfills. Whenever I wear something vintage for the first time I can’t help wondering who it used to belong to. I’ve got a gorgeous silk 1920s dress and I’d love to know who wore it originally. Was she young, old, fair, mousy, dark or a fiery redhead? Did she wear it to a dinner party, a night at the ballet or a lovers tryst? Did she have to save up for months to afford it or did she just wear it once and then leave it hanging in her wardrobe? Have you got any great tips to share? Or any questions about wearing vintage? Let’s hear what you’ve got to say! Great tips. My vintage collection started with brooches and cardigan clips…then gloves…then hats…then EVERYTHING. Starting small was my only option as I didn’t have the budget for any larger items. I especially love the mix and match tip. Sometimes you can feel (when you look at other gorgeous vintage bloggers) that you have to find a style (or decade) and stick to it. But you don’t have to. You can wear whatever you want with whatever you want. As long as you feel good. My only other tip would be in #4. You can always have your vintage finds altered to fit you perfectly. 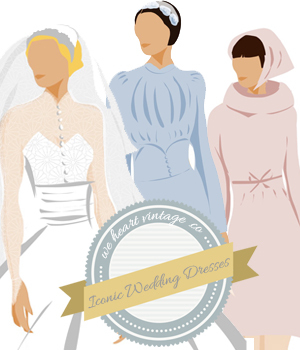 I have a great lady here in Melbourne who specialises in vintage alterations. I know I can trust her with my goods. But if you learn to sew you can easily adjust the waist and hem to suit you. Also, as an Australian size 18 (I think that’s a US 14), please don’t think there is no vintage out there for you. I have recently passed on plenty of beautiful things because they were way to big for me and currently have a closet full of beautiful dresses (everything from a handmade 60’s brocade wiggle dress to shirt dresses to a gorgeous 50s house coat). It may take a bit of hardwork to find them, but if you are already plus sized and are like me, you are used to looking hard to find something that looks good. Thanks for sharing your tips, it’s great to hear how other people first ventured into vintage! It’s good to hear too that there are plenty of clothes around in larger sizes, as with everything in vintage I guess it’s all a case of tracking down those items you just LOVE. Everyone who shops for vintage will have experienced that frustration of finding the most to-die-for outfit that’s in the wrong size, and your tip about getting vintage clothes altered is a great idea. My own sewing skills aren’t up to that at the moment, but I might try and find someone who could do it for me, thanks! I’m off to check out your blog now, you’ve got me intrigued by your vintage style!